© 2010 Jorge Argueta. All rights reserved. 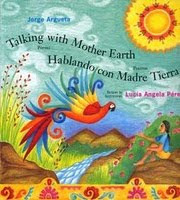 Jorge Argueta has won numerous awards for his books of bilingual poetry, including the Américas Award for Children's and Young Adult Literature. His background - he's a native Salvadoran and Pipil Nahua Indian who grew up surrounded by love in a house with dirt floors before leaving his civil war torn country to come to the U.S. in 1980 - lets him draw on themes and topics that are far afield from what I can draw on... yet his use of language and images and his point of view enable me to connect with his poetry completely. Whether he's writing about nature or the contrasts between countries or food - he is writing a series of cooking poem books, the first of which Sopa de fijoles/Bean Soup was a Junior Library Guild Selection in 2009 - I can honestly say that his poetry makes me wish I could read Spanish so I could appreciate each poem for the first time twice. I'm truly excited to have Jorge Argueta here at GottaBook as part of 30 Poets/30 Days. Yesterday gave us Move Out! by Carole Boston Weatherford. Tomorrow... Susan Marie Swanson with Wonders. For more on 30 Poets/30 Days and ways to follow along, please click here. ...an inexplicably, I now want a mango. I don't even like mangoes, but this made me want a sweet one, and a party to go with it. Adore that last line: Now is a song. Sigh. Hey Greg, typo alert--"Signs" is supposed to be "Sings" in the 5th stanza. Very beautiful stuff, thanks! lovely poem! i've actually had the privelege to see this mango tree in jorge's hometown. it is enormous! I have to say, it was thrilling to find that I could read this lovely poem in Spanish. The only problem was the absence of mangoes in my home right now...Going shopping. Love mangoes, this poem, and Bean Soup! Now, more than ever, I wish I knew Spanish! Thank you for posting this poem. It was so cool we all want mangoes! from Ms. Nisman's fifth grade homeroom class the "Rice Owls"